Jesús Luis Ocaña Pernía was a Spanish professional bicycle racer who was a natural climber with a versatile talent for time trialing. He won the Vuelta a España in 1970 and the Tour de France in 1973. A gifted cyclist Ocaña’s legendary career led to a tragic end for this Champion’s extraordinary life. Luis Ocaña started racing with a club in his adopted home Mont-de-Marsan (Landes, France) and began racing professionally in 1968 with the Spanish Fagor team. He became the Spanish National Champion in his first year, 1968. He won the Mountain Classification and finished second overall in the Vuelta a Espana in 1969. These great victories gave Spain a bright new champion. Ocaña signed with the French team Bic in 1970 and set his sights on the Vuelta victory that year. The Vuelta a Espana celebrated its 25th anniversary in grand style. A very fit Luis Ocaña battled with Agustin Tamames into the final day’s stage 19b time trial. The final saga of the great 1970 battle between race leader Agustin Tamames and young Luis Ocaña played out on the 29 km road from Llodio to Bilbao . The individual time trial would decide the victor. As predicted Luis Ocaña dominated the stage, winning by 1'01” over second placed Jesus Manzaneque and 1'15” over race leader Agustin Tamames. A disappointed Tamames fell to second place in the General Classification. Luis Ocaña claimed his first victory in one of the three Grand National Tours and Spain celebrated the coming of their new Spanish Champion. Eddy ”the Cannibal” Merckx was unbeatable in his first two Tour de France appearances. At the 1971 start line of the Tour Merckx was the overwhelming favorite. Before the TdF Luis Ocaña finished third behind Merckx in Paris-Nice and second behind Merckx in the Critérium du Dauphiné Libéré. When the hard climbing stages began, a young generation of talented climbers began to boldly attack Merckx. Stage 8 featured a finish at the top of the renowned Puy de Dome. Dutchman Joop Zoetemelk, Luis Ocaña, Lucien Van Impe, Bernard Thevenet, Joaquim Agostinho and Gosta Pettersson all took turns attacking the race leader. Four kilometers from the finish, Spaniard Luis Ocaña launched the decisive move and broke away from the elite group. At the finish line Ocaña had well deserved stage win. Even though his time gain was only 15 second the psychological gain was significant. Merckx maintained the Maillot Jaune, but the seeds of doubt had been planted. 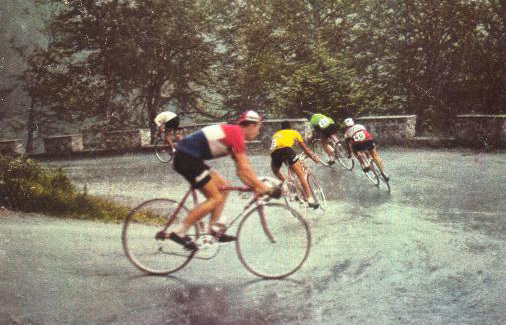 Two days later on stage 10 from St. Etienne to Grenoble, the aggressive racing continued. As the lead group crossed the summit of the Col de Cucheron, Merckx punctures on the descent. While the race leader waited for a wheel change, the lead pack rolls away. The breakaway, led by Luis Ocaña, opened a 1-minute gap on a hard chasing Merckx. In Grenoble the breakaway gained 1'09” on Merckx and Zoetemelk taking the Maillot Jaune by 1 second over Ocaña. Tensions remained high for stage 11 in the Alps, Ocaña, Zoetemelk and Van Impe joined a breakaway group ahead of Merckx and Gosta Pettersson. Teammates deliver Merckx to the beginning of the 11.1 km, 6% finishing climb to Orcieres-Merlette well behind the breakaway. The defending champion charged up the climb but finished the stage 3rd on the stage, 8'42” behind the new race leader, Luis Ocaña. The beleaguered Cannibal was in the unfamiliar position of trailing by 9'46” in the General Classification. The Tour was set to enter the tough climbing of the Pyrenees Mountains. Stage 14 from Revel to Luchon was a legendary stage that featured the climbs of the Portet d'Aspet, Col de Mente, and Col du Portillon. The weather was less than ideal as the riders left Revel. Thick black clouds threatened as the peloton traversed the narrow Portet d'Aspet descent. Needing time gains Merckx attacked and pulls away on the Col de Mente. Ocaña answered immediately and joined Merckx. As the two approached the summit of the climb the black clouds opened up with torrential rain, large hailstones, lightning and thunder. Rivers of water flowed down the narrow mountain road. Over the foggy summit of the Col de Mente, Merckx, an excellent downhill rider, plummeted insanely down the narrow, mountain road. Against the advice of his team director Maurice de Muer a prideful Ocaña followed Merckx’s every move, taking serious risks of his own. Flying through a corner several miles into the descent the Cannibal lost control and skidded into a low retaining wall at the side off the road. Ocaña trailing close behind cannot avoid the fallen Merckx and crashed heavily. Merckx was up quickly and sped away. In his haste Ocaña struggled to release his cleats from the toe clips. While still on the ground he was struck in the kidney by the pursuing Zoetemelk. The Maillot Jaune lay on the ground screaming with pain. Quickly the race director and medical team arrived to assess his injuries. Luis Ocaña was rushed by helicopter to the hospital in St. Gaudens for treatment. He recovered from the crash but his 1971 Tour dreams had come to an end. The 1973 Tour de France was tailor made for a Spanish climber. The Tour profile was one of the most mountainous in Tour history. Four-time defending champion Eddy Merckx chose not to race because of the riggers of his early season triumphs. Luis Ocaña, winner of the Dauphine Libere, Raymond Poulidor, winner of Paris-Nice, and Dutch climber Joop Zoetemelk headed the list challengers for the overall Tour victory. 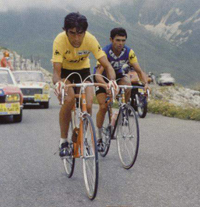 SPECIAL NOTE: Luis Ocaña came to the TdF in 1973 with a new lightweight bicycle material. After working with aviation engineers, Ocaña discovered bicycle tubing made of titanium. On the third stage Luis Ocaña distanced his rivals. The cobblestoned stage began in Roubaix and when the peloton started the cobbled section at Querenaing, Ocaña and four teammates attacked and split the field. The breakaway grew to 10 riders and gained five minutes before the chasing elite reduced the time gap to 2’34” at the finish. Spanish climber José Manuel Fuente was the big loser finishing seven minutes behind stage winner Cyrille Guimard. Ocaña continues his move to the top of the overall classification as the Tour enters the main Alpine climbing on stage 7. The morning of the two-part stage, Ocaña attacked his adversaries again. He arrived alone at the finish in Gaillard with a 53 second lead on the main contenders. The race lead passed over to the aggressive Spaniard. The profile of the brutal stage 8 included two category 1 (HC today) climbs (Galibier and Izoard) and two category 2 (Cat 1 today) climbs (La Madelaine and Telegraphe) before the finish line at the top of the category 1 Les Orres. Ocaña and Spanish countryman Jose-Manuel Fuente managed to breakaway from the other contenders as they began to turn the lead from seconds into minutes. On the finishing climb to Les Orres Ocaña succeeded in dropping Fuente and won the stage by 58 seconds. Bernard Thevenet lost 6’ 59”, Zoetemelk, Lucien Van Impe, Joaquim Agostinho, and Poulidor all lost 20’24”. 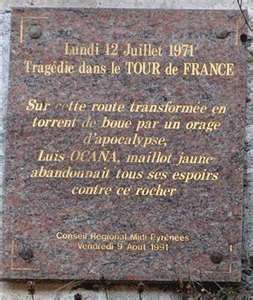 Luis Ocaña rode into Paris with a 15’51” lead on second placed Frenchman Bernard Thevenet. His dominance included six stage wins; control of the Maillot Jaune from stage 7 until the end in Paris. Luis Ocaña was one of the most talented riders to ever race a bicycle. But Ocaña was somewhat fragile. He became inexplicably ill and was victimized by a curious number of losses to his top-racing form. He explained it as “his curse”. In 1973 Ocaña crushed everyone in the Tour, winning by 15’51”, however, the prideful Spaniard quietly tormented himself because of Merckx’s absence. In his own mind the Tour victory was tarnished by not measuring up to his own definition of success. To some degree Ocaña considered the absence of that success as a failed life. After retiring Ocaña returned to Mont-de-Marsan (Landes, France) and put his life and money into a vineyard business. In the early 1980’s Ocaña entered a sports journalists’ driving competition, flipping his car and almost losing his life. Following a blood transfusion gone wrong he slipped into a depression. His misery continued as his attempt to become a vintner fell on hard times. He made little return on his investment. Eddy Merckx’s great respect for his rival saw the Belgian organize a large wine order from Ocaña's ailing vineyard. The troubles of life accelerated and caused his wife to leave him. He was also diagnosed with a hepatitis C infection. As his downward spiral continued Ocaña contracted cancer. He kept his condition so private he worked to exhaustion all through the Vuelta a Espana as a radio and television commentator. His torment became too much on May 19, 1994, Luis Ocaña was found with a self inflicted gun shot wound. He was pronounced dead at the hospital in Mont-de-Marsan. Luis Ocaña lived his life by very high standards. Even when he achieved racing greatness his personal measurement of the accomplishment fell short of full satisfaction.